Despite the many fabulous restaurants and foodie destinations in cosmopolitan Barcelona the city does not have any 3-star Michelin restaurants. It does, however, have a long list of awarded chefs including 4 2-stars and several with one star, some of which are true institutions. Gaig, previously called Fonda Gaig, is one of them. Founded in 1869 and still a family business, Gaig is the product of the awarded chef of the same name and his wife, at the front of house. The couple used to own another restaurant which had amassed two stars but was closed down in a few years ago so that Gaig could focus on his original restaurant. He moved to the original location and continue doing what he does best: traditional and modern Catalan cuisine like my grandma would cook in a warm and homey setting. Check out my detailed guide on Where to stay in Barcelona with details on each neighbourhood and best hotel recommendations – Psst I am a local to the city! Located at the heart of the city, the restaurant has a lower level section where most of the tables are and a few private rooms in the floor upstairs for larger groups. We arrive at 1,30pm for a reservation at the same time and there is already a group of diners waiting outside. The restaurant ones not open its doors until then. Once you walk in you are immediately stepping into someone’s living. The décor is in wood the color of hay with touches of dead nature in the form of tree branches. It is slightly slightly cold but this feeling disappears as soon as the young waiter or the chef’s wife takes our order. Friendly and heartwarming, she talks as if we were the regular customers coming every week for lunch. The cheese cart sits in the middle of the main room, waiting to be discovered. A few steps down is the more private and cozier section for couples. The restaurant has managed to perfectly accommodate families and couples in the same room but yet with the natural separation of a leveled space. This part of the restaurant is flanked by plush leather sofas against the walls and smaller tables are lined along the curved corners. At a bustling Saturday lunch time this part feels much quieter than the vibrant family section where tables are from 4-6 people. Diners are remarkably Catalan, local and probably from the neighborhood although a couple of tables are filled with visitors or foreigners. It is always important to see restaurants frequented by the locals and this, in a city like Barcelona who welcomes millions of visitors a year, is an even higher achievement. 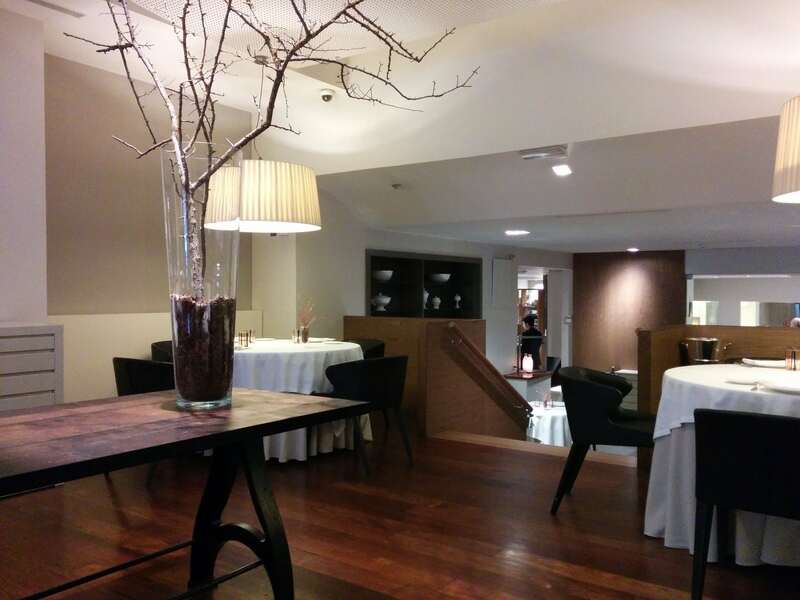 Gaig offers two set degustation menus and an a la carte menu. All dishes are traditional Catalan recipes, some of which are so old that even I have never heard of them. But my mum is quick to explain their origin and preparation. 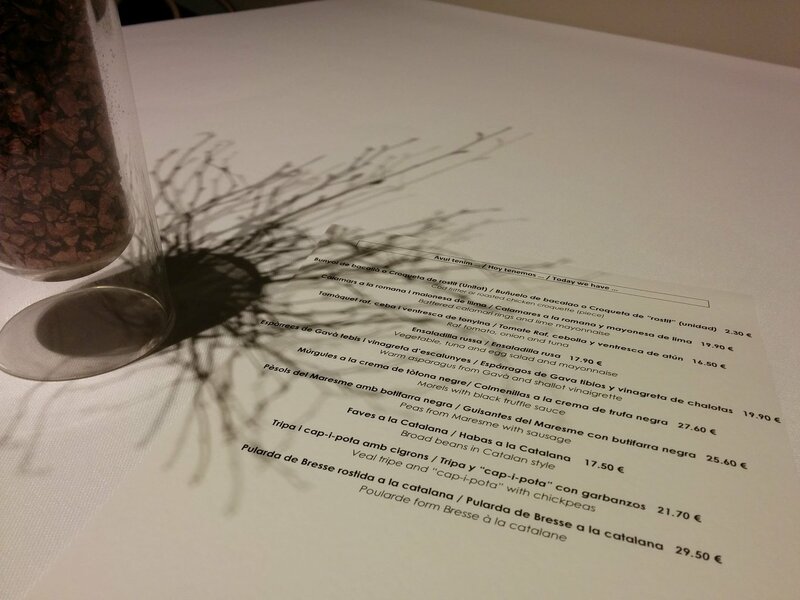 The chef has also tried to give a modern touch to some of the old recipes. The traditional set menu looks delicious and homey, melancholic even for someone who lives abroad like me, so we go for it. We get a couple of home made chips, two olive cookies and cheese sticks to entertain our hunger. It is a version of the vermouth that is so typical of the Spanish and Catalan way of life. The sommelier provides the very complete wine list but I am driving so we settle for two glasses, a Gewurstraminer and a Verdejo, two opposite sweet and dry wines. 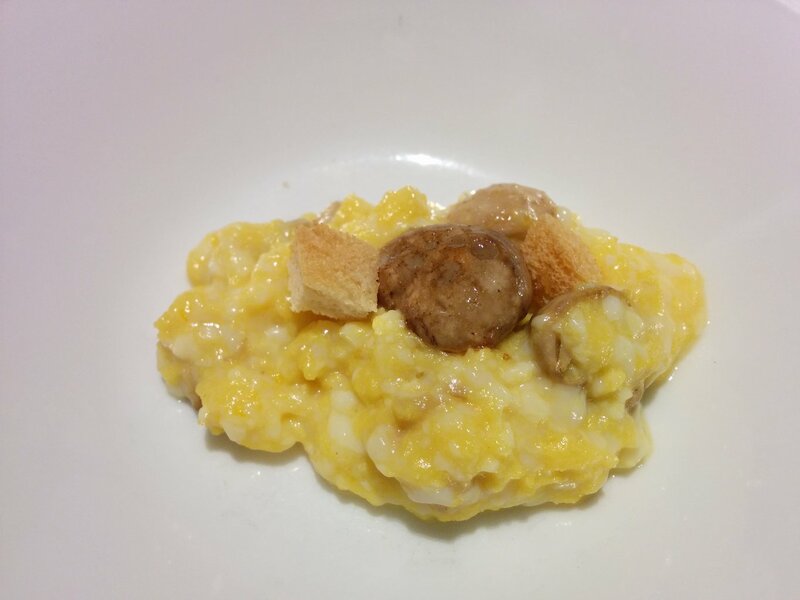 We get the chef’s appetizer made of scrambled eggs and mushrooms with a dash of truffle. For such a simple dish it is smooth and creamy and perfectly fluffy like clouds on a plate. 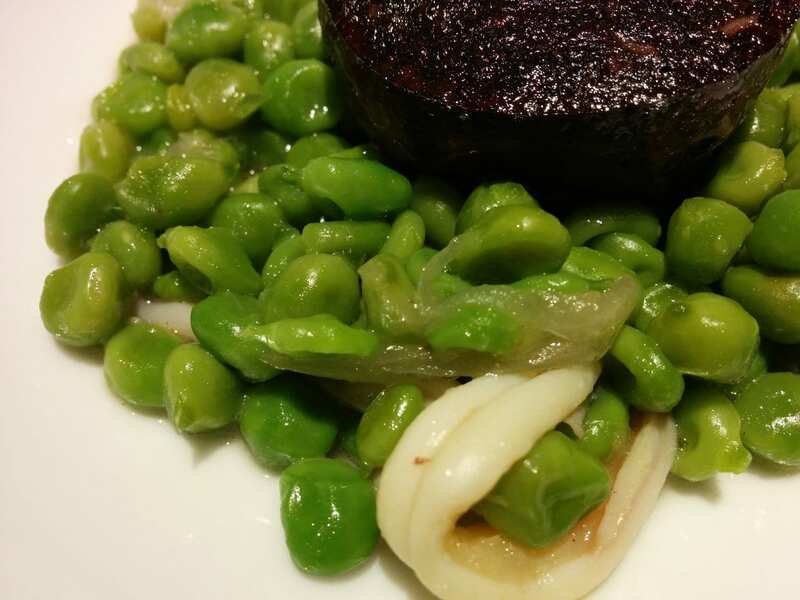 Our feast starts with the creamiest of rice blood sausages laid carefully yet messy-looking, on a bed of spring green peas and some “espadrenyes” seafood for flavor. The green peas are extremely fresh and young. 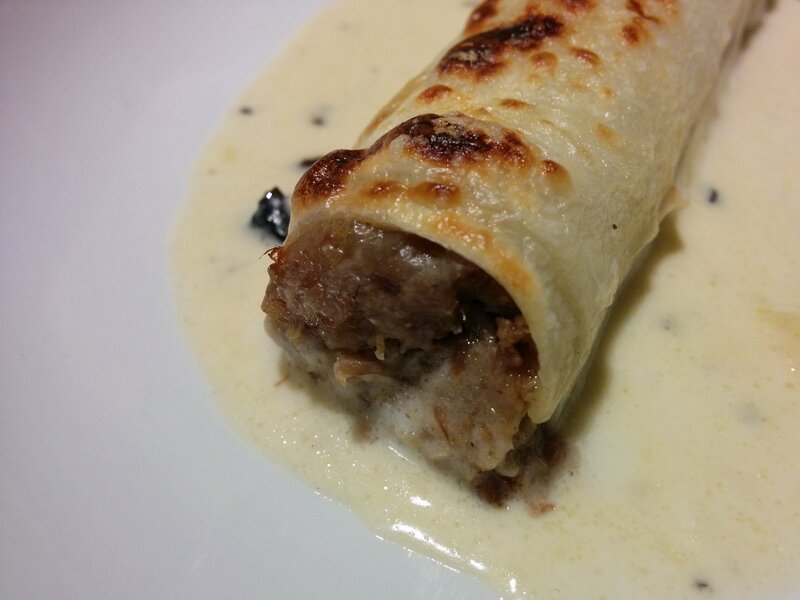 Gaig’s specialty dish is cannelloni, one of the most traditional Catalan dishes. These are bursting with pulled meat and wrapped around with soft pasta in an almost perfect cylinder then gratined in the oven. The béchamel, the key secret ingredient to the dish, is possibly the most buttery I have ever tasted. It is thin and packed with flavor and smell. I can see the tiny pieces of truffle floating on it. They are indeed reason enough to come to Gaig. 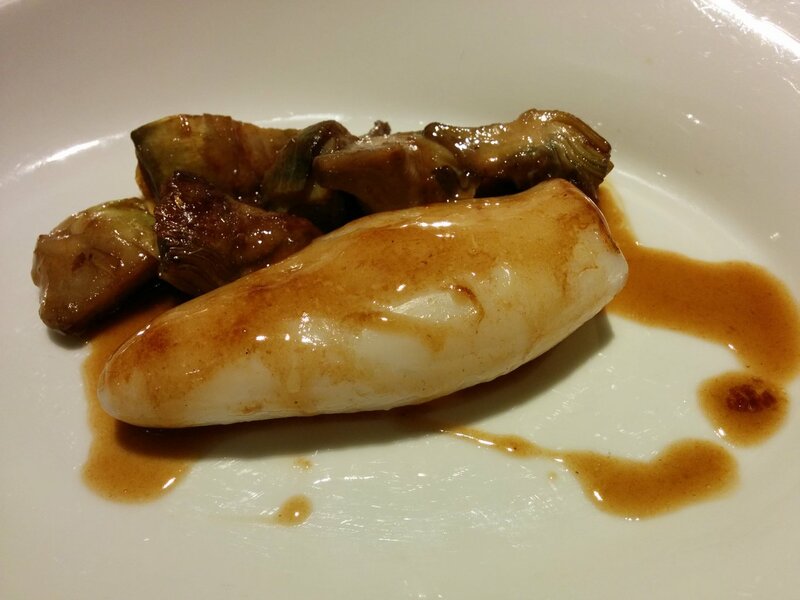 After the cannelloni came a lighter dish with tender calamari, poached artichoke hearts and an earthy red wine sauce. I dipped bread into the béchamel and I am going to dip even more of the crunchy farmers bread into the wine sauce, because it deserves it. Perhaps the weakest of the dishes was the salted codfish. This is another usual suspect of the Catalan kitchen, as is from Spanish and Portuguese. I remember buying this codfish and preparing it when I was younger. The salted fish keeps for very long and, traditionally, fishmongers would sell fresh fish as well as the salted codfish. Salt simply serves as preserving agent and the fish needs to be desalted over 24h with regular water changes to make sure that it is re-hydrated and all the salty flavor is removed. If done correctly, the fish should be salted to taste as the water soaking should remove all of the salt. 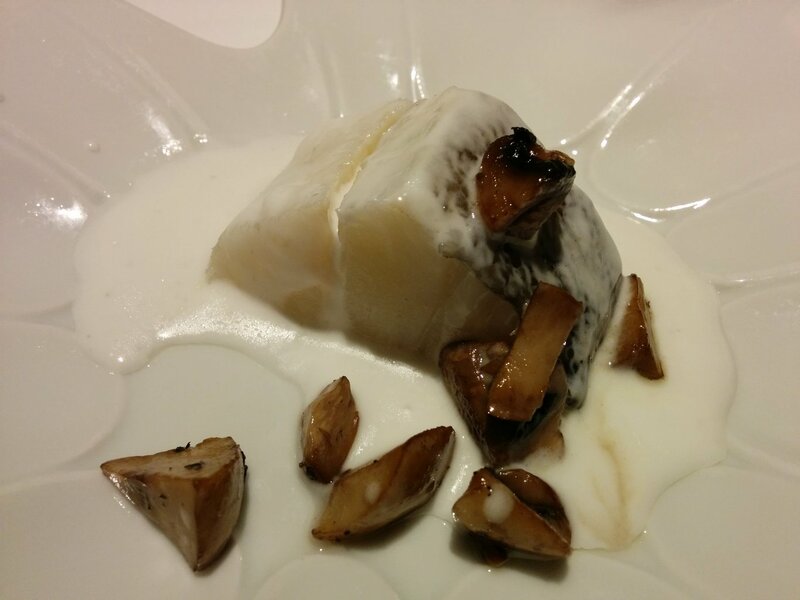 I found the codfish to be slightly dry and bland although the white soft sauce was pearly and smooth. I found this dish to be a miss and wondered if it was meant to be like that. Next up is another gem. 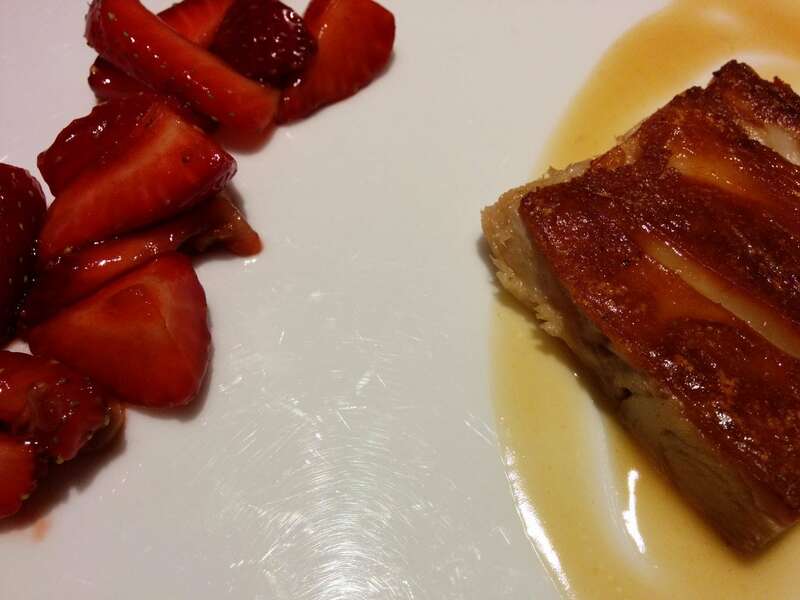 The cochinillo’s tasty and tender meat has been pan fried to a crunchy skin layer and paired with baked strawberries in a sweet wine sauce. They are cooked, but only lightly, still maintaining all of their freshness, perfect to cut the richness of the pork. 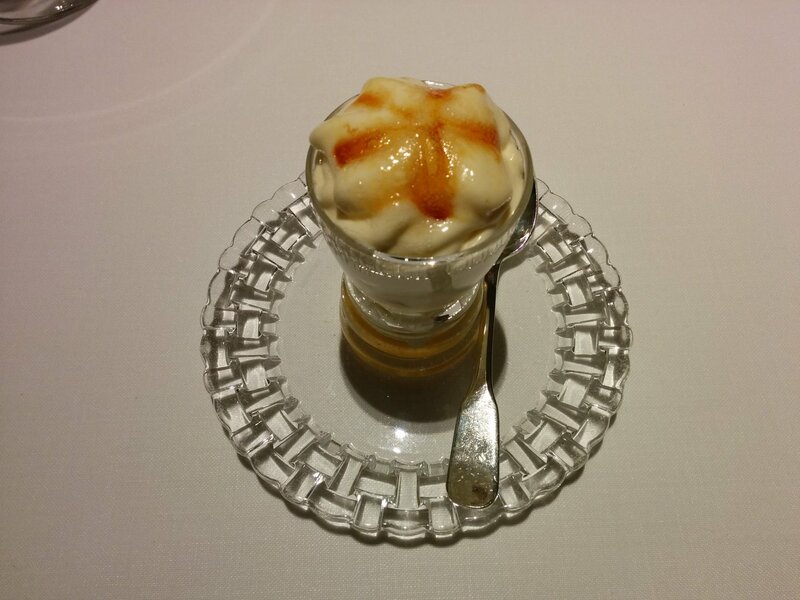 Possibly the most obvious Catalan dessert is Crema Catalana. Without a doubt, nothing screams authentic more than this, except that, nowadays, you can find it abroad because it is also a French pudding. Essentially made with egg yolks, lemon, milk and sugar it is a relatively easy to make desert that is a crowd pleaser. Gaig has decided to re-construct it into a different texture and presentation but with the same childhood memories and flavors. Presented in a tall glass and with a bottom layer of lemon syrup topped with toffee ice cream, a foamy cream and caramelized orange, it is as delicious as it is pretty. Sadly, I scoop it out too fast and run out too soon. But dessert odes not end here. There is one final attempt at a happy ending with a chocolate cocotte topped with a caramel crisp that holds a vanilla ice cream almond. 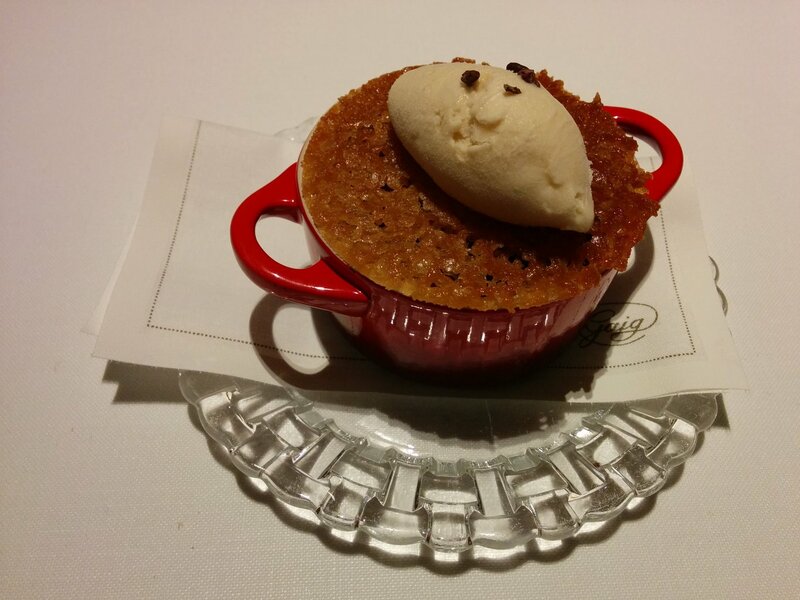 The cocotte is chocolate fondant without the liquid chocolate. It is soft without being runny and chocolaty without the sweetness. As we finish the last bits of the delicious meal we are full without needing to take a nap. We have been good with the bread, only savoring a bit at the beginning, dipped into one of the most incredible olive oils I have tasted, and some more later to finish off the sauces on some of the dishes. The dishes are the right portion size. Enough to enjoy each recipe without being overwhelming. 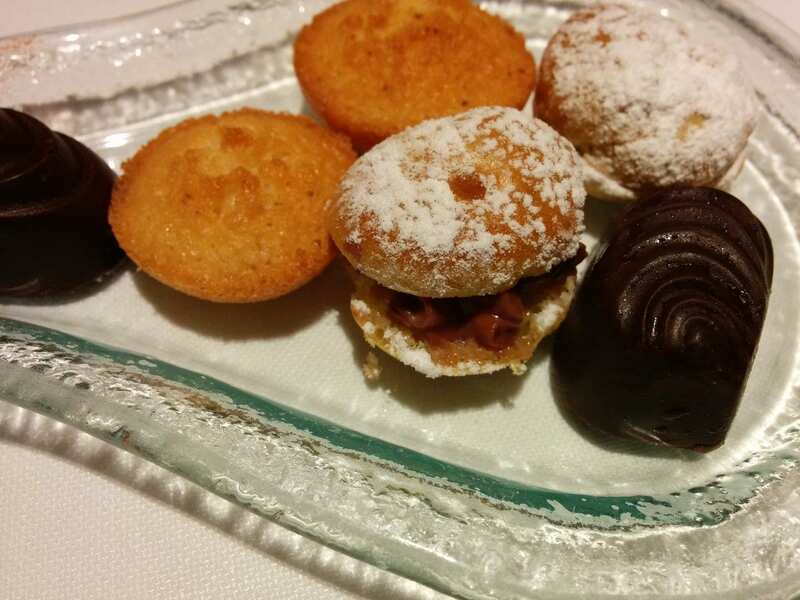 The meal cannot end without some delightful petit furs, in this case, we get a glass tray holding tiny airy profiteroles, truffles and mini-madeleine. We devour everything. If you only have one day in Barcelona, this is how you should spend it! Enjoy this one day itinerary for Barcelona by clicking here. As a family run restaurant this is a business of love. It is casual and unpretentious as much as it is elegant and refined. The chef walks over to each table towards the end of our meal as we have just devoured the crema catalana. I am at my peak and can’t help but complement him profusely. This is one of those pleasant meals you enjoy at someone’s house. He appears flattered, even timid. His wife took our order and the rest of the servers deliver each of the dishes. She is friendly and accommodating to our changing the first dish in the set menu. I feel as if we are visiting an old friend eager to share all the recipes. If I ever have visitors in town I would be sure to take them to Gaig. It is the sense of familiarity of an old fonda without the pretentiousness of a Michelin-starred and heavily awarded chef. The food is delicious, homey and traditional. It maintains an air of sophistication and friendliness, if that is at all possible. We paid 150 euro (with 20 euro tips) for the two set menus, water and two glasses of wine which I found a reasonable price for the quality, the dash of history on our plates and the love with which the husband and wife team deliver their passion for food.